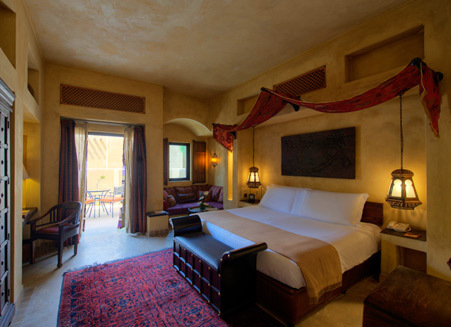 Rising up from the desert sand dunes like a mirage, Bab Al Shams Desert Resort and Spa is an elegant retreat in a traditional Arabic setting. Whether you’re after romantic Arabian nights or an authentic desert experience, here awaits splendour, tradition and comfort. With its literal translation from Arabic meaning ‘gateway to the sun’, Bab Al Shams is built in an Arabic fort setting in and around an oasis. Inside the walls, shaded courtyards, walkways and water features provide cool shelter and maintain the unique ambience and atmosphere. In Room Facilities are High Speed Internet Connection, International Dial up Telephone, Coffee & Tea making facilities, Satellite TV & Radio, Mini Bar, Generous selection of Bathroom Amenities – Bloom & Dorothy Prentice, 24 hour In room dining, Wake Up Service, Hair Dryer, In Room private safe, Beautifully appointed Bathrooms with rain showers, Daily Room Servicing, Turn Down Service. Special Features – choice of desert or courtyard view, located on the upper (second) floor. Maximum 2 adults, 1 child below 12 years old and 1 child up to 3 years old. If both children are above 3 and below 12 years old, additional room is required. Private transfers to and from Dubai International Airport or other locations within Dubai are available at a charge (please provide 24 hours notice). King size bed, located on either the ground or upper floor. Some suites have access to Patio or Garden area. A separate Majlis seating area is adjacent to the bedroom. Maximum 2 adults, 1 child below 12 years old and 1 child up to 3 years old. If both children are above 3 and below 12 years old, an additional room is required. Relax in the privacy of your very own sun terrace, dine alfresco or entertain in the sitting/living area. Our traditional Junior Suites with own private balcony or patio offer both authenticity and all modern comforts with an area of approximately 70 sq meters. They are located on the ground or upper floor. All suite guests enjoy complimentary breakfast. In room facilities are high speed internet connection, international dial up telephone, coffee & tea making facilities, Satellite TV & radio, mini bar, generous selection of bathroom amenities, hair dryer, private safe, beautifully appointed bathrooms with rain showers. A separate Majlis seating area is adjacent to the bedroom. Whether you seek an intimate atmosphere for two or additional space for the family, the Deluxe Suite will exceed your expectations. The Deluxe One Bedroom Suite with own private balcony or patio offer both authenticity and all modern comforts with an area of approximately 60sq meters. In room facilities are high speed internet connection, international dial up telephone, coffee & tea making facilities, Satellite TV & radio, mini bar, generous selection of bathroom amenities, hair dryer, private safe, beautifully appointed bathrooms with rain showers. The suites are located on either the ground or upper floor with access to either a balcony or patio. 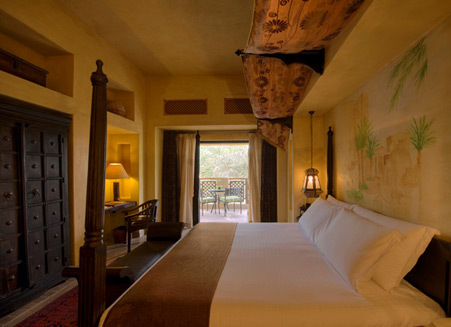 Some suites have uninterrupted desert view, some are facing inwards towards landscaped gardens or the “Palm Grove”, which is a larger landscaped area within the resort. A large walk-in dressing room is connected to the bathroom with separate rain shower. The Suites offer a combined king bedded room with separate Majilis style lounge. All Suite guests enjoy complimentary breakfast. 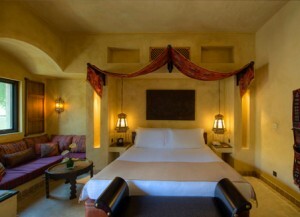 Special Features: The suites are located on either the ground or upper floor with access to either a balcony or patio. 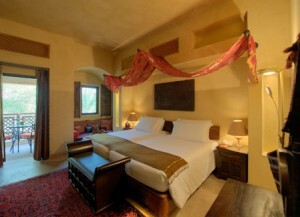 The Suites offer a combined king bedded room with separate Majilis style lounge. All Suite guests enjoy complimentary breakfast. Delightfully traditional suites with own private balcony or patio offer both authenticity and all modern comforts with an area of approximately 68-81 sq meters. Some feature a kitchenette. All Suite guests enjoy complimentary breakfast. In Room Facilities are High Speed Internet Connection, International Dial up Telephone, Coffee & Tea making facilities, Satellite TV & Radio, Mini Bar, generous selection of Bathroom Amenities – Bloom & Dorothy Prentice, 24 hour In room dining, Wake Up Service, Hair Dryer, In Room private safe, Beautifully appointed Bathrooms with separate Bath and Shower, Guest WC, walk in dressing room, Daily Room Servicing, Turn Down Service. Located on either the ground or upper floor with access to either a balcony or patio. 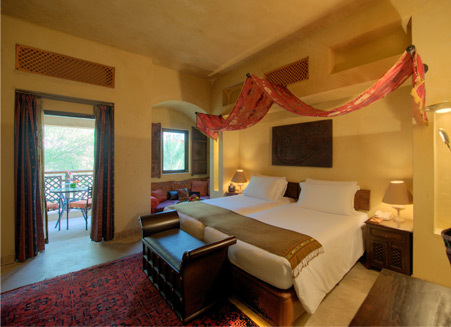 Some suites have uninterrupted desert view, some are facing inwards towards landscaped gardens or the “Palm Grove”, which is a larger landscaped area within the resort. A separate Majilis seating area is adjacent to the bedroom. Interconnecting to a Deluxe Room on request. Located on either the ground or upper floor with access to either a balcony or patio. A separate Majilis seating area is adjacent to the bedroom. Interconnecting to a Deluxe Room on request. As the gateway to the sun, Bab Al Shams Desert Resort & Spa is renowned as a sanctuary of traditional Arabian comfort, peace and tranquility. We are also pleased to be able to offer you an endless range of activities to get your pulse racing; we call it leisure, activity and re-invigoration.